How to setup the Inertial Sense EVB-2 as a base. 1. Plug EVB-2 into computer using EVB USB port. 2. Press the CONFIG button on lower left corner of the EVB-2 until the configuration LED is either green, blue, or purple. This connects the EVB USB port directly to the µINS module. b. Click on Find Devices button until EVB-2 is shown in list. The box next to the corresponding COM port should be checked. c. Click on the RTK Tab followed by the Base Mode Tab. Under Correction Output select a message type and GPS antenna source for one or both of the serial ports. Click apply. Please refer to the block diagram below to select the proper serial port for your base output. *Note - It is important that the actual base position is known. This position should be entered in DID_FLASH_CONFIG.reflla. Alternatively the Survey In feature on this page can be used to identify the base position. 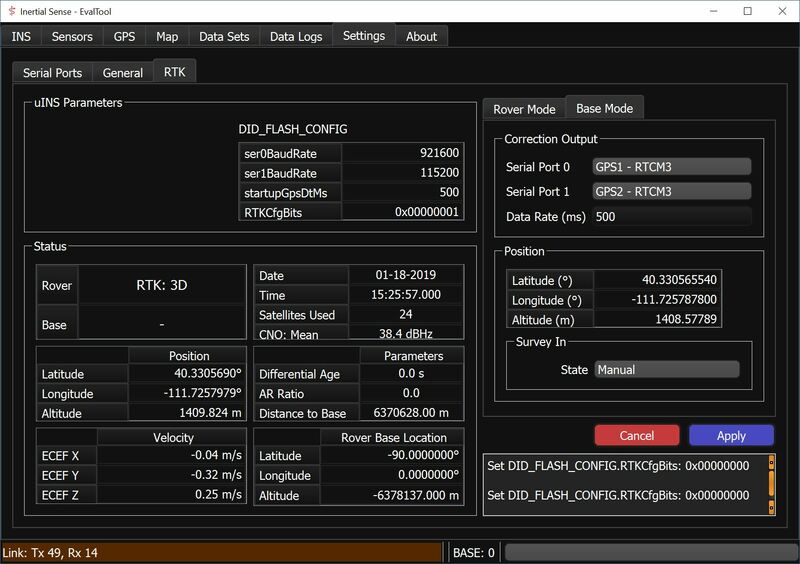 Use argument -flashConfig=RTKCfgBits=0x40 when starting CLTool to configure device as base that outputs RTCM3 messages from GPS1 out of serial0. 4. Connect GPS Antenna - More information on antennas can be found in the user manual. a. Press the configuration button until the configuration LED is blue. This will configure the XBee radio so that base corrections messages are sent via XBee to the µINS rover where they will be interpreted as base corrections. b. Use EvalTool or SDK to set DID_EVB_CONFIG.radioPID (integer 0-9) and DID_EVB_CONFIG.radioNID (hex 0 - 0x7FFF). These values need to match the values of the rover XBee radio. Press the configuration button until the configuration LED is either green, blue, or purple. This connects the EVB USB port to the µINS module. Any computer connected to this USB port can capture base corrections data received over the virtual COM port which is created when this USB port is connected. The messages can then be forwarded to the rover using any number of communications methods. Press the configuration button until the configuration LED is green or blue. This connects the EVB-2 header 3 pins to the µINS module serial0 port via RS232. Any RS232 compatible device can receive the base corrections data using this connection. Note - In this configuration the XBee radio is also active and communicates with the µINS serial1 port while the RS232 connection communicates with the µINS serial0. Press the configuration button until the configuration LED is purple. This connects the EVB-2 header 3 pins to the µINS module serial0 via RS422/485. 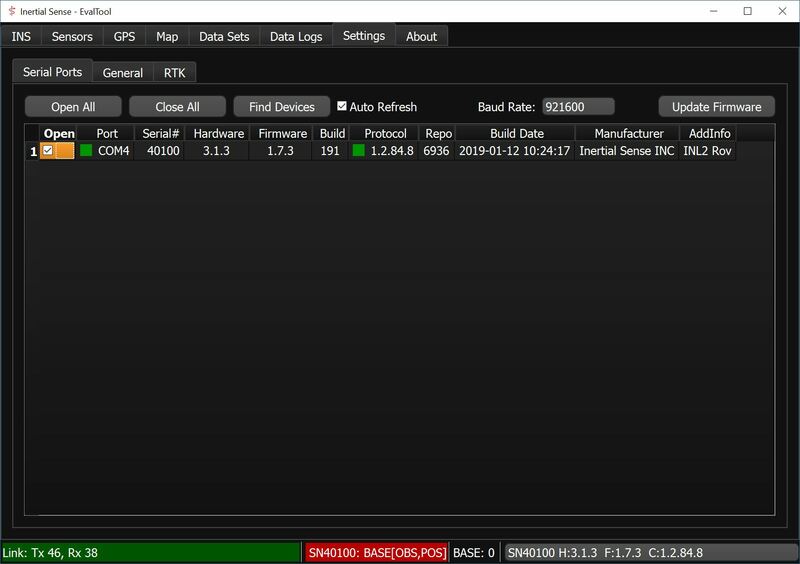 Any RS422/485 compatible device can receive base corrections data using this connection. Note - In this configuration the WiFi and BTLE modules are also active and communicate with the µINS serial1 port while the RS422/485 connection communicates with the µINS serial0. Press the configuration button until the configuration LED is green, blue, or purple. This connects the EVB-2 header 4 pins to the µINS module via TTL. Any TTL compatible device can send base corrections data using this connection. The µINS will recognize the corrections packets and interpret them correctly. Note - In this configuration the XBee radio and WiFi/BTLE should not be used as this TTL connection communicates with the µINS serial1. WiFi and Bluetooth Low Energy are not currently able to broadcast Base Corrections.